How this combines the best of Paleo Diets and Vegan Diets? The GRAY areas of the Pegan Diet? What does someone on the Pegan Diet eat? The Pegan Diet or Paleo vegan diet coined by Dr. Hyman has been one of the hottest topics on the Internet. I have been a grateful follower of the Paleo diet since January 2014 and I have to say, it’s changed my life. I just feel amazing, I look amazing and to use a phrase from Tony Robbins, I awakened the giant within. The scientist in me (degree in biochemistry) always pushes me to keep up with current trends and urging edge research and I have to say I am not afraid to use myself as a Guinea pig. One exciting development in the world of diet and fitness is the Paleo vegan diet or the pegan diet which has been coined by Dr. Hyman and I must say, I am convinced to give this a try as it is interesting and does make sense from a scientific point of view. I know this is going to really piss a lot of people off but let’s look at it from an objective point of view. Athletes are the prime example of human beings in top physical condition. Look at Lebron James, he attributes his success to being a Paleo. Makes sense, he cuts out all processed foods and gluten and he is one of the finest athletes in the world. On the flip side, take a look at Rich Roll, this beast of a man completed 5 ironman marathons in the space of a mere 7 days! And this guy is vegan! Now here lies the problem. What’s the best diet or lifestyle to follow? Do you give up grains and beans (like Lebron James) and eat meat and fat with no limits or do you give up all animal derived foods in favour of beans and grains like Rich? Dr. Hyman has come up with a genius proposition here and I recommend everyone watch this space as this Could get explosive. Dr. Hyman has taken the best bits of the Paleo diet and the vegan diet and combined them to coin the phrase, pegan diet. Ok, so before I get ahead of myself, let’s take a look at the commonalities between the Paleo diet and the vegan diet. Carries a low glycemic load as these diets cut out refined carbohydrates ie stuff that’s easy to digest. Features a lot of fruits and veggies. This is great for high fibre, nutrients to stave off disease and general health as well being. Not contaminated by additives, pesticides, hormones and other crap as long as you stick to organic stuff. No chemicals and flavourings and other drugs. High in good fats which has been scientifically proven to reduce heart disease. High in protein for muscle building and keep cravings at bay as you stay fuller for longer. Ok so no we need to talk about the shady bits and that is the not so clear cut areas. Dairy – now this is avoided by both the Paleo and the vegan camps and for good reason as well. Consumption of dairy has been linked with diabetes, obesity and a lot of ailments so it really is not that good for you but only in small amounts. Grains – this is a definite no no for us Paleos but a staple for vegans. Beans – again this is a definite no for Paleos but vegans depend on this for fibre and most importantly protein which is hard to come by in a vegan diet. Meat – high quality organic meat is a staple in the Paleo diet and not allowed on a vegan diet. With all this in mind, what does one do? Does one go Paleo? Does one go vegan? Or does one go pegan? So what does a Pegan dieter eat? Pegan dieters will focus more on nuts and seeds to get their protein. 75% of their diet will consist of vegetables. Eat mostly lentils and low starchy beans. I personally am still a fan of my beloved Paleo diet but I will keep a close eye on this pegan diet until more research and experiments have been carried out into the long term effects of subjects on this diet. I love Dr. Hymans idea and concept and scientifically it makes sense. 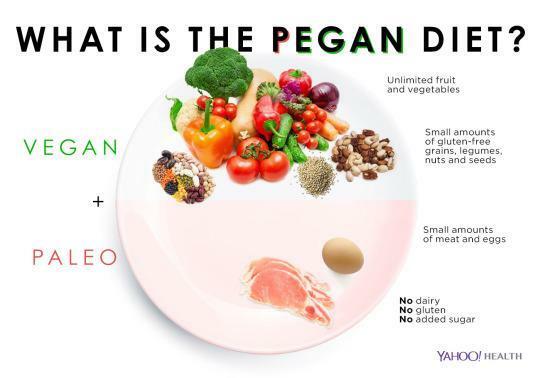 It would be great to get some experimental data behind this and who knows, the pegan diet may be the next big thing in the world of dieting and lifestyles. Are you a fan of the Paleo Diet or do you think this Pegan Diet has legs? Would love to hear from you in the comments below and maybe some recipe ideas? Hello world! Are high protein diets like the Paleo or Atkins Healthy?